A cartoon that draws on Norman Rockwell's iconic painting of an African-American girl defying school segregation to defend Education Secretary Betsy DeVos has sparked a firestorm of criticism. Outraged that DeVos is being compared to Ruby Bridges, whose bravery was immortalized in the 1964 painting “The Problem We All Live With,” critics let their feelings be known on social media about the cartoon, which appeared in an Illinois newspaper. “How could we get more black support?” “Let’s compare a billionaire lady to a 6 year old who needed armed guards to get her to school." Stung by the criticism, Belleville News-Democrat cartoonist Glenn McCoy apologized "if anyone was offended." “My cartoon was about how, in this day and age, decades beyond the civil rights protests, it's sad that people are still being denied the right to speak freely or do their jobs or enter public buildings because others disagree with who they are or how they think," McCoy said in an interview Wednesday with Talking Points Memo. 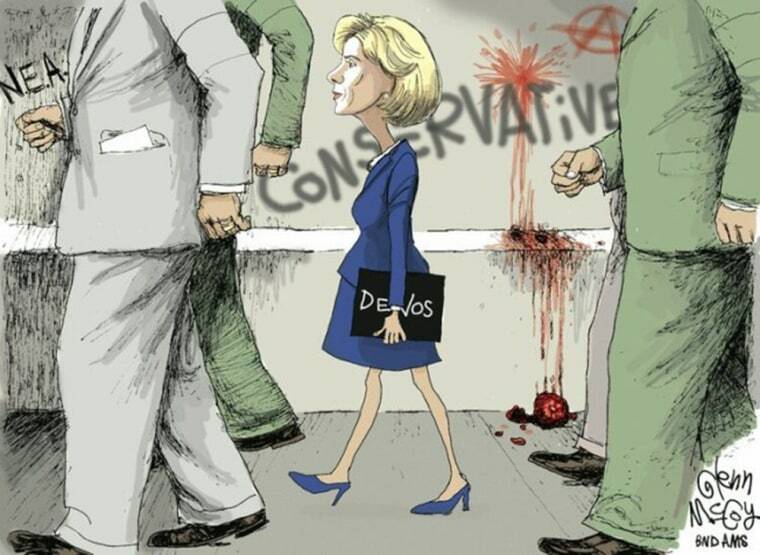 McCoy said he was inspired to draw the cartoon after DeVos was blocked from entering a public school by protesters last week in Washington, D.C. He said he believed he was "speaking out against hate." DeVos was sworn in as secretary of education last week after Vice President Mike Pence, in a historic first, was forced to step in and break a 50-50 tie in the Senate so she could be confirmed. Critics have accused DeVos of trying to undermined the public school system she now leads by championing charter schools. Braving an angry white mob, Bridges had to be escorted into her New Orleans school by four deputy U.S. marshals — an indelible photographic image that Rockwell later captured on canvas. Shannon Clash is a desk assistant in the Washington bureau of NBC News. She was previously a production assistant and intern for WRC-TV. She is a graduate of the University of Maryland.